Learn how to make sprouted brown rice flour at home. With simple step by step instructions you can make your own gluten free flour, full of nutrients and great for so many uses and recipes. 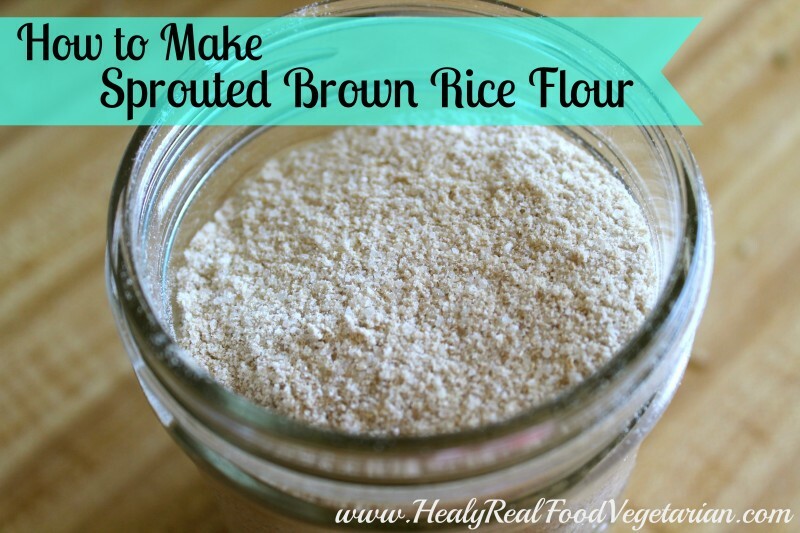 Why Make Sprouted Brown Rice Flour? Apart from the added nutritional benefits to sprouted grains and legumes, sprouting also cuts down on phytic acid- an enzyme inhibitor that can block the absorption of key vitamins and minerals. Brown rice has also been found to contain arsenic (read more here) and sprouting can decrease the levels of arsenic. Sprouting and soaking grains, legumes, nuts and seeds was a common traditional practice long ago, but since the development of processed and convenience foods, it has lost it’s popularity since you have to take time and patience to sprout or soak. Even though sprouting or soaking can take 12-36 hours, it’s mostly a “set-it-and-forget-it” pursuit. You don’t need to be in the kitchen for 12 hours watching your grains soak. You can set them up to soak or sprout and generally leave them for a long while, only coming back to quickly rinse the sprouting grains every few hours. As it turns out, there’s a reason that the traditional practice of soaking and sprouting was so prevalent and spanned many continents and cultures. It has many nutritional benefits. Sprouting is a process that germinates grains, seeds or legumes which in turn makes them more easily digested and produces additional vitamins and minerals including vitamin C, vitamin B and Carotene. Another benefit to sprouting and soaking is the resulting decrease in phytic acid. Phytic acid is an enzyme inhibitor, which means that it blocks the absorption of vitamins and minerals and can also cause poor digestion and an unhealthy gut. Some have even linked phytic acid and improperly prepared grains to the rise in tooth decay. If you do eat grains, it’s best to soak or sprout them first. The way that you sprout any grain, seed or legume is the same, only the amount of time you sprout it changes. You can also check out my post on how to sprout red lentils or how to sprout quinoa. For the reasons stated above, I almost never consume grains without sprouting or soaking them first. A lot of gluten-free store bought foods contain rice flours that might be hard to digest and may contribute to an unhealthy gut because of phytic acid. 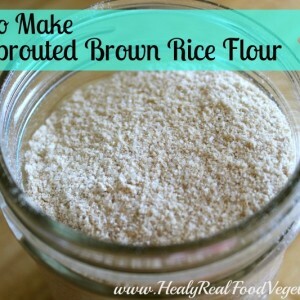 Have you tried this recipe for How To Make Sprouted Brown Rice Flour? Don’t forget to rate the recipe and leave me a comment below. You can also follow me on Facebook, Twitter, Instagram, Pinterest and YouTube. Put 1 cup of rice in a jar and fit with the sprouting lid. Pour water in the jar and rinse the rice and pour out the water. Then, fill the jar to the top with filtered water. Let soak overnight or for at least 6 hours. After the rice has soaked, pour out the water and rest the jar upside down over a bowl or dish so it is allowed to drain. Every 3-6 hours, rinse the rice, pour off the water and place upside down so it can drain. The rice will sprout within 2-3 days. You will notice sprouts coming from the rice. 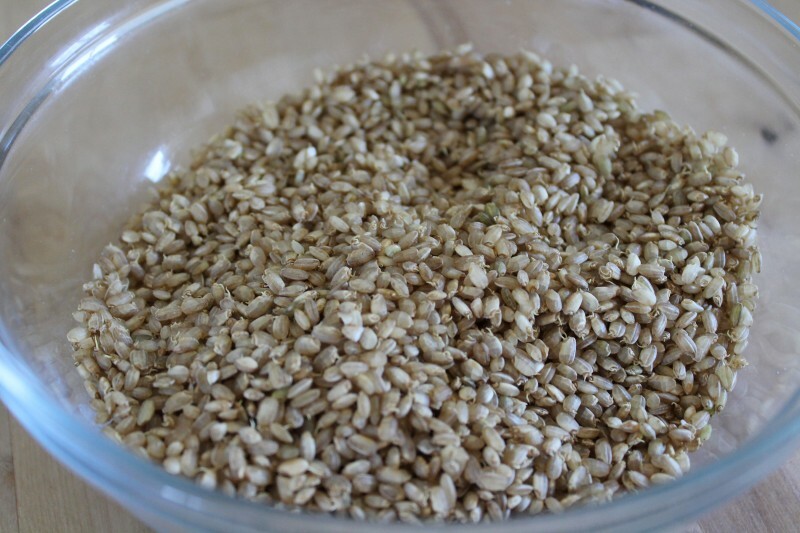 Place the sprouted rice in a dehydrator and allow the rice to dry completely. I set my dehydrator at about 125°F and let it run overnight. Once the rice is dry, place small batches in a coffee grinder and grind it until it resembles flour. 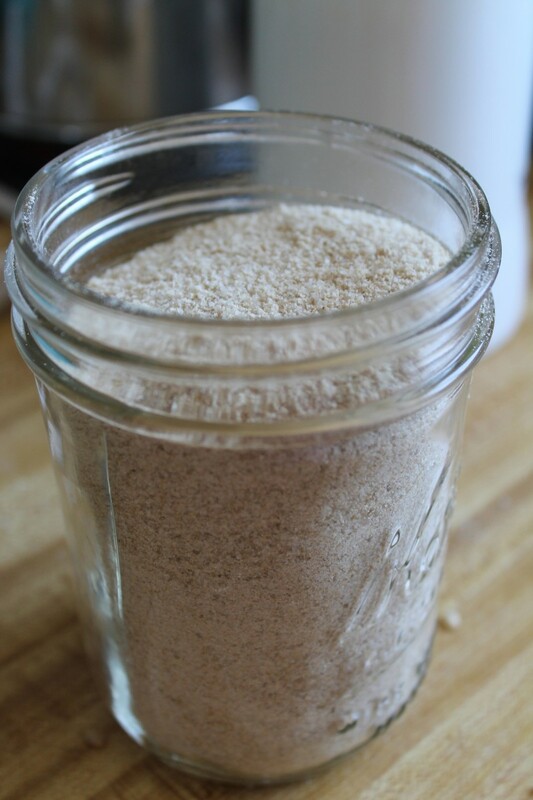 Pour the flour into a mason jar and continue grinding small batches until the rice is gone. Keep the rice flour in the fridge to keep it fresh. 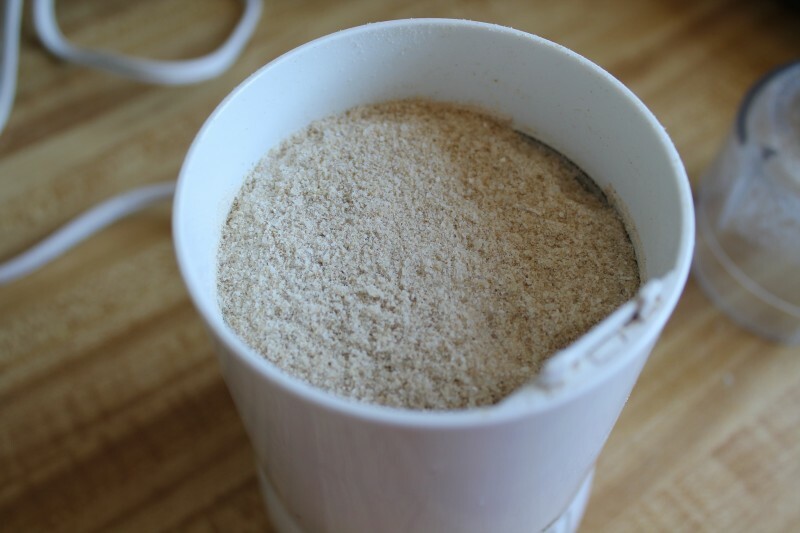 A coffee grinder will work fine to make rice flour, but you can only work with small batches. 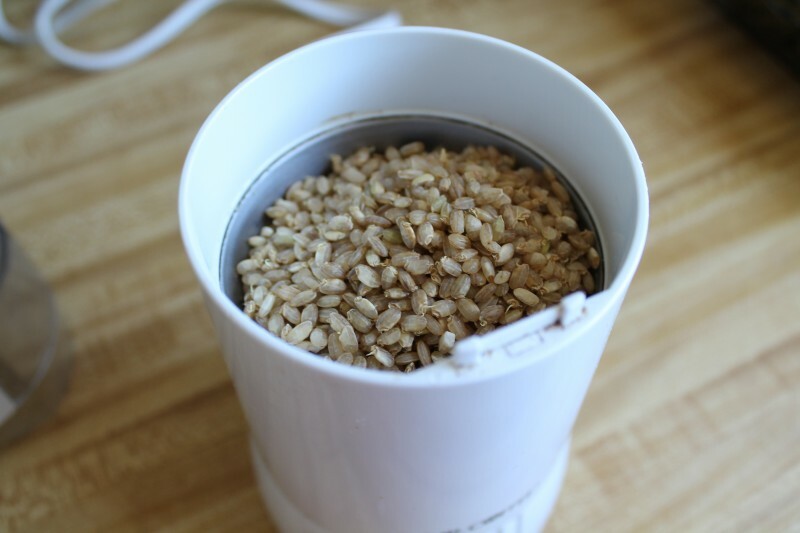 If you often use sprouted brown rice flour and are serious about consistently making your own, you may want to consider investing in a grain mill. As you can see there is a lot involved in the process of making your own sprouted brown rice flour. For many real foodies or people on a traditional diet, this may not be an issue, because a lot of you may already have most of these supplies like a dehydrator and grain mill. Thanks for your post and the clear directions. You may want to store the flour in the freezer instead of the fridge though, if you want to slow down oxidation of the flour. How many cups of flour does one batch make? Now can I do this with wild rice, do I need to?? I’m not sure. I’ve never sprouted wild rice before. I think you could sprout it, but I don’t think it would make the same consistency of flour. What do you do about rinsing the rice overnight? Thanks for your post! I’m so interested in making sprouted gluten free flour.